It's not hard to make a dress and customize it to perfectly fit your figure. 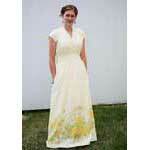 Choose from one of the free dress patterns below. Pick a great fabric and make a quick, easy dress or one that you take your time with and get all the detailing and bling exactly right. Make a belt for it also as an accessory. There are many cute belt patterns to choose from on SewingFreebies belt page. Here is a simple dress pattern for an easy to sew cotton dress to add to your spring and summer wardrobe. This pattern has only 3 pieces to help you create a wrap dress that is both flattering to the figure and comfortable to wear. 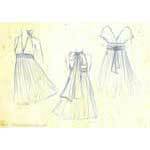 Step out in this beautiful tiered gown with an empire waist that you made using these easy to follow instructions. The dress in the picture was made with a bedsheet but you can use any fabric to make this long, high waisted dress. Take an old t-shirt, one stylish belt and add this step by step dress pattern for a awesome tube top dress. With it's plunging neckline and tear drop hole on the back this dress is designed to get noticed. This comfy pattern requires an old tank top and a small amount of fabric for a lovely spring and summer dress. All it takes is 2 yards of fabric plus 11 seams to create this goodlooking jumper that can be dressed up or down. This form fitting halter dress has seams that run lengthwise to flatter a petite figure. It only takes a single hour to sew this simple dress that with the right accessories will go from the office to a night on the town. 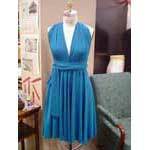 A halter dress can be worn for most any occassion plus it's shoulderless design helps keep you cool and comfortable. 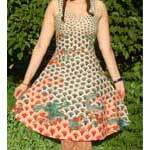 This cute summer dress with spaghetti straps is cool and comfortable plus extremely easy to sew. Sew this lovely nautical dress using a white t-shirt, navy blue & white stripped fabric plus a few other supplies. 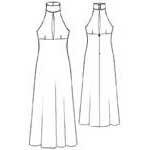 Here are instructions along with pictures to help you make a sun dress with a bra styled top and a A-line skirt. Pattern for a gorgeous cocktail or party dress with an empire waist and a ruffled neckline that sits off the shoulder. 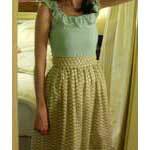 A single skirt can easily be turned into a pretty halter dress when using this simple pattern with photos. Create this adorable and flattering dress that can be worn most anywhere, day or night. 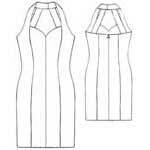 Create this attractive convertible dress by following this pattern with a complete list of required materials. Create this stylish summer dress that can easily be dressed up for a night out or down for everyday wear. 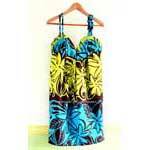 Make summer a little cooler with this hot sundress that is not only flattering to the figure but easy to make too. With its sweet sculped collar and simple lines this charming sundress will be a favorite to the one who wears it. This lovely chemise styled dress is perfect for when a more sophistacated look is needed. 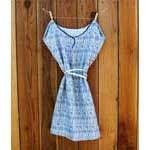 Using 3 yards of fabric and a ribbed tank top, you can make this inexpensive and attractive summer dress.